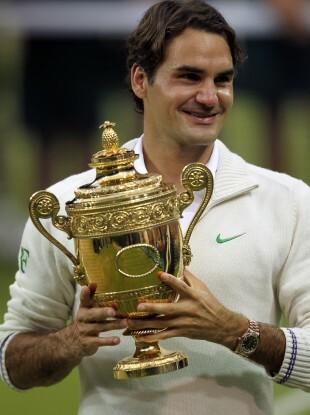 Roger Federer with Wimbledon title number seven. ROGER FEDERER LINGERED as long as the cameras had flashes on centre court as he soaked up the acclaim following title number seven in a remarkable Wimbledon career. The 30-year-old’s win saw him take home Grand Slam number 17 and meant, Federer joked, that he would be off babysitting duty for the night. The arrival of twin daughters, Charlene and Myla, were a bright point in Federer’s life amid a period of high profile defeats in major tournaments. He dropped from number one in the world as he was overtaken, first, by Rafa Nadal and then Novak Djokovic but, Federer claimed, he never lost faith in regaining the top spot. I played some of my best tennis in the last few matches. I seem to play my best tennis in the semi-finals and finals here and it happened again. Federer had some words of consolation for an emotional Andy Murray moments after the Scot had been defeated in his fourth Grand Slam final appearance. He said, “He has done so well over the years and has been so consistent. It shows how important tennis and Wimbledon is to him. Murray, for his part, took a while to compose himself and remarked ‘I’m getting closer’ before receiving a rapturous applause from the crowds inside centre court. Federer’s win equals the Wimbledon Mens’ record of Pete Sampras. Email “I never stopped believing says Federer after Wimbledon win number seven”. Feedback on “I never stopped believing says Federer after Wimbledon win number seven”.